It was an as usual tiring day from office and I alighted at Andheri Station to walk home at around 7:30 pm. As I walked home, I see this huge procession on the road. First my cautious brain stopped me and said, is it a religious fest and am I gonna be held up in the midst of it.??? Then the sight of what I saw, not only gave a sense of relief but also an exuberating feel that I am blessed to witness the Chatrapathi Shivaji Jayanthi on Feb 19th. Chatrapathi Shivaji was born in Feb 19, 1627 to Jijabai and Shahaji Bhonsle. He was named after a local Goddess Shivai. He was known for his knowledge on Hindu epics of Ramayana and Mahabaratha, which were constantly inculcated into him by his mother. He was known for his love towards his mother. And more than everything else, he was known for his military powers and the establishment of the Maratha Empire. Well, a little flashbacks from my History books from those lovely school days. Coming back to Andheri, what I witnessed first was truck, essentially a tableau of Chatrapathi Shivaji’s golden colored bust with people dressed up as soldiers guarding on either sides. 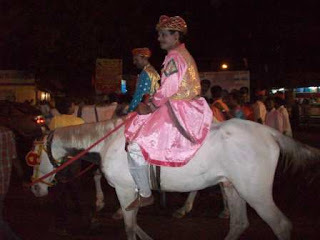 This was followed by several people dressed up as Chatrapathi Shivaji riding on horses. This was followed by the traditional Powada Dance of Maharashtra which a tribute to Chatrapathi Shivaji. I personally found this Powada Dance similar to Oyilattam of Tamil Nadu, essentially a folk dance having a fabric in hand with an astonishing leg beat. With my never fading love for folk dances, this was refreshing since the last time I enjoyed in Mylapore Panguni Bramhothsavam. I had a perfect evening listening to the unstoppable beats and energizing rhythm at the end of the day. Only I wished I could come across such a performance on every lazed lethargic afternoons which can re-energize me to run non-stop for the second innings of the day. I hope to upload the video of the spectacular performance, if I get a good video compressor software (the original file is 34 mb, gotta reduce it!) soon. Let's see.! 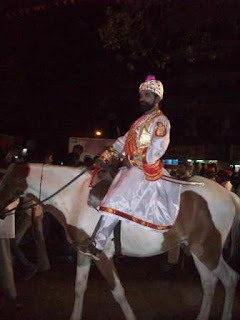 On Feb 19th every year, Chatrapathi Shivaji Jayanthi is celebrated in a grand way all over Maharashtra. 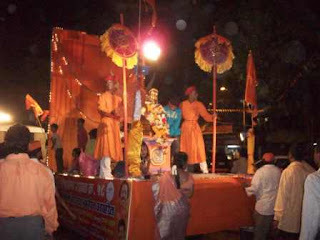 In Mumbai these processions happen everywhere on roads and public and private grounds and parks. The school teacher asked the class "If 5 sheep eat up all the grass in a meadow in 28 days, how many sheep will eat up the grass in 20 days?" "Seven sheep, sir," flashed back the answer even before the teacher finished his question. 'Who is it that answered without working out the sum?" Thundered the teacher. Two or three voices shouted, "Bal, sir." The teacher went near Bal. He took his note book and glanced through it. Should he not at least take down the problem, let alone work it out? "Where have you worked the sum?" Bal, with a mischievous smile, pointed to his head with his index finger. "You should work the problem in your book," the teacher said. 'Why? I will do it orally," replied Bal. Bal's classmates found it difficult to under- stand certain problems even when the teacher did them thrice. But, to Bal mathematics was as easy as drinking Water. your post made me nostalgic - felt a longing for the sights and sounds of mumbai, a city i love.